‘The best Maribelle, especially for you!’ a large sign on the edge of the orchard tells passing traffic. 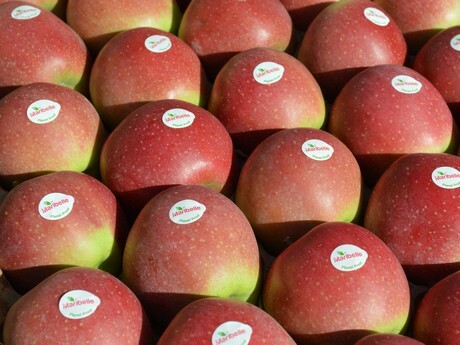 The pinkish red apple variety has been around for roughly ten years, but the variety name was unknown on the market. Some years ago, a group of growers and traders started working together to present the Maribelle under its variety name. 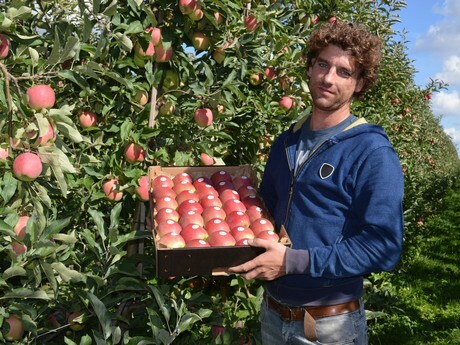 René Wellner of Roel Wellner Fruit from Est, the Netherlands, is one of those growers. “With the Maribelle, we can be distinctive on the market,” René says. The family company is traditionally focused on the production of apples. The principal varieties are Elstar and Red Boskoop Welbo, but Maribelle has also had a permanent spot in the orchard for some years now. Of the 40 hectares owned by Roel Wellner Fruit, 12 hectares are planted with Maribelle. The remainder is split between Elstar, Jonagold, Red Boskoop and Celica Welbo. The company’s roots are in Geldermalsen, but Roel Wellner moved to Est for an expansion. “My grandfather founded the company,” René says. “We’re traditionally focused on the export to Germany and Eastern Europe.” René’s father built up this branch of export. In the past ten years, the market has changed, and export is becoming more difficult. René, who will take over the company with his brother Jeroen, is more focused on the domestic market. “We decided to market Maribelle with various traders and growers. In the future, we as growers should work together more often, because it provides us with opportunities,” René says. The Maribelle is a free apple variety, which means it’s even more special that the growers are working together for sales. “The Wellant is another a free apple that’s appreciated, particularly by market traders, and it performs well,” René gives a second example from the sector. To increase the familiarity of the variety, limited actions are being set up with retailers. 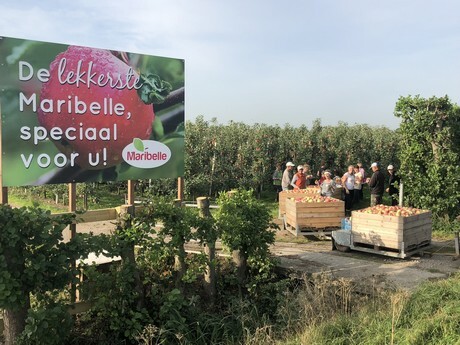 As of this year, the orchards in the Betuwe feature large signs to promote the variety. “We’re doing small-scale promotions, but we mostly rely on word-of-mouth advertising,” René concludes.